Jaap van Zweden transformed the sound of the Dallas Symphony Orchestra the past ten years. He led the DSO on a triumphant tour in 2013 to Vienna, Hamburg and Amsterdam. And these next two weeks will be his last as music director. If somehow you haven’t heard over the past two years, you should know that that van Zweden is leaving to lead the New York Philharmonic. We sat down with the conductor in his office at the Meyerson Symphony Center for some final reflections as he was preparing Beethoven’s Ninth Symphony, which will be his farewell concert next week. You’re facing your last few weeks with the DSO. If the New York Philharmonic had not come calling, what would you be planning to do? 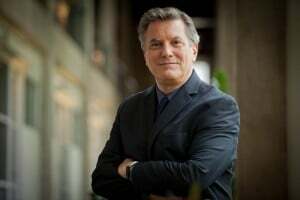 Dallas Symphony Orchestra performs Wagner’s ‘Die Walkure’ May 18th and 20th, and then Beethoven’s Ninth Symphony May 24-26th. One of the things that you said when you came here that you wanted to do was to give the DSO a rigorous background in the German-Austrian canon from Mozart to Wagner, Mahler to Bruckner, and you’ve certainly done that. What do you think you can bring to the New York Philharmonic that it needs? 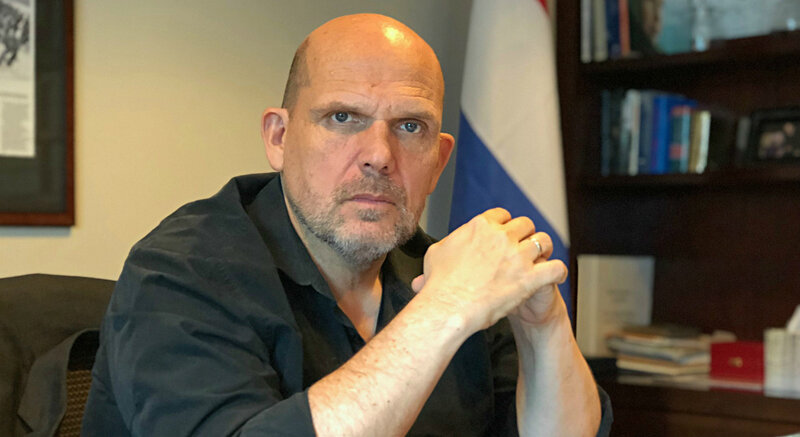 Jaap van Zweden in his office at the Meyerson Symphony Center. Photo: Hady Mawajdeh. I think that the New York Philharmonic is an orchestra whcih is completely all-round. But there are some certain things I would like to underline in the future. I think that composers like Haydn and Mozart were not so much in the spotlights there. And also, to be a chameleon as an orchestra, to switch from very contemporary and new music into Bach, that’s where we can make maybe some steps. At least, I would like to introduce a different way of playing that, especially the Bach. And maybe the Mozart. You know, talking not too much with the left hand [while playing the violin] but talking with the right hand. And that’s a very technical thing, you know. And for the rest, it’s going to be easier to tell you in a few years what we accomplished than predict it. I have to ask: You’re inheriting the podium of Toscanini, of Mahler, of Bernstein, of Boulez – major figures in 20th century music. What does that mean to you – in the 21st century? Well, it means that those people were champions for new music. But before Dallas, I was music director of a radio orchestra in Europe and one of the highlight always for me was the new pieces because if we are not going to have new music, we are going to die. You know, the privilege to work with composers who are still alive, it is very inspiring. Coming back to the New York Philharmonic with new music, I think that it one of the very big attractions for me. 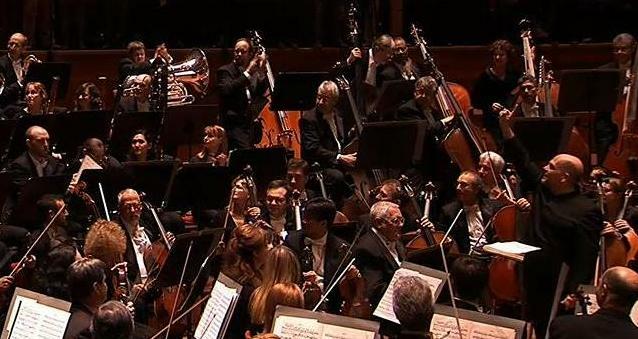 Jaap van Zweden (right) signals the horn section to stand after the DSO’s triumphant concert in Amsterdam in 2013. Looking back on your ten years here, what is it you’re most proud of? And what is it you’ll remember best? I think that, you know, the warmth of the DSO family and the hard-core people around the orchestra I’m going to miss tremendously. I’m going to miss my audience here. We have a phenomenal audience. It is an audience which I got very close to, and that’s not so normal. But I always opened the green room [for after-concert chats] whenever it was possible. You know, when I came in ten years ago, Dallas was an incredible sports town. I mean, it still is. But you could also feel a shift a little bit into a real arts town, and if you see what happened here with the musea, with the new buildings, with the fantastic new opera house, all this incredible input from individuals. I think that Dallas is still an incredible sports town, but culturally, it’s absolutely national and international on the map. And I”m really proud of that and that is not only because I came here but also the enormous input of everybody who recognized the wonderful I would say quality of what is happening in this town.